For all marine & reef aquariums. Treats 950 gallons! All natural removal of sludge, fish waste, and other unwanted organic pollutants. Fast, safe and easy. 100% chemical free. 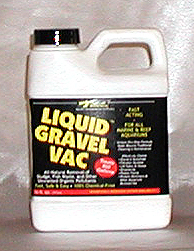 Liquid Gravel Vac utilizes the natural sciences of aquatic environmental chemistry to formulate this powerful, one-of-a-kind product. One of the key components is billions of mother natures own housekeepers: aerobic heterotrophic bacteria. These little overachievers provide all natural, stress-free removal of detrimental aquarium pollutants such as uneaten fish food and fish waste through healthy bioremediation. No more accidental bruising or breaking your fragile marine life such as corals, anenomes, or starfish with siphon tube. Helps prevent accidental suffocation of your biological filter by eliminating oxygen consuming, dead and dying organic matter. *Protein skimmers and other aquarium accessories.